New Law Gets Tough on Animal Abusers…Animals now have greater protection thanks to a tough, new law which recently took effect targeting those who abuse animals. Act 10 of 2017, also known as Libre’s Law, strengthens existing animal cruelty laws and makes it easier to prosecute a person who knowingly mistreats, abuses or neglects an animal. Specifically, the new law outlines three tiers of cruelty and neglect, with charges ranging from a summary offense for denying an animal food or shelter to a third-degree felony for intentionally torturing an animal or causing serious bodily injury or death. The new law also requires convicted animal abusers to forfeit their animals, sets limits on how long an animal can be tethered outdoors, and clarifies penalties for abusing a horse. Is Your Vehicle Exempt from PA Emissions Testing? Vehicle emissions inspection programs are part of a statewide effort to bring cleaner air to Pennsylvania. The emissions inspection is required annually in conjunction with the safety inspection. Motorists should shop around for the best price and convenience, just as is done for the safety inspection. However, several criteria could make a vehicle exempt from emissions requirements. The vehicle has been owned for one year and driven less than 5,000 miles in the prior year. However, motorists must go to an emissions inspection station to verify the vehicle’s mileage and receive an exemption sticker. The vehicle is a new car, not previously titled and has less than 5,000 miles before registration. Motorists should receive an exemption sticker valid for up to 12 months upon receipt of the new car from your new car dealer. Exemptions are determined by a certified emissions inspector. Please remind your mechanic if your vehicle falls into one of these categories. The station can charge a fee to issue an exemption sticker. Additionally, motorcycles are excluded from the emissions inspection program as are vehicles registered as street rods, classics, collectibles, antiques or specially constructed vehicles. Motorists can visit www.drivecleanpa.state.pa.us for additional information on Pennsylvania’s Vehicle Emissions Program. 2017-18 Hunting Guides Now Available… Residents can now download the 2017-18 Pennsylvania hunting information guide by clicking this link. The booklet provides information on obtaining a hunting license, safety tips, bag limits, dates for hunting and trapping by Wildlife Management Unit (WMU) and updates from the Pennsylvania Game Commission. Residents can call my Hershey office at 717-534-1323 to reserve a hard copy of the guide. Hard copies are also available at the following outreach locations in the 106th District: municipal buildings of Derry, Swatara, Lower Swatara and Conewago townships; and Hummelstown, Royalton and Middletown boroughs; Hershey Public Library; William H. and Marion C. Alexander Family Library; and Middletown Public Library. Bonus Available to Persian Gulf Conflict Veterans…Veterans who served on active duty in the Persian Gulf Theater of Operations, including Operations Desert Shield and Desert Storm, are reminded to apply for the Persian Gulf Conflict Veterans’ Bonus. The bonus pays $75 per month for qualifying, active-duty service members, up to a $525 maximum. For personnel whose death was related to illness or injury received in the line of duty in Operations Desert Shield or Desert Storm, an additional $5,000 is available to the surviving family. Service members who were declared prisoners of war may also be eligible for an additional $5,000. Since 2008, more than 9,000 Persian Gulf Conflict veterans have applied for and received a bonus for their war efforts. Individuals who received a bonus or similar compensation from any other state are not eligible for the Pennsylvania program. The deadline to apply for this one-time payment is Aug. 31, 2018. Click here for more information about eligibility requirements or how to apply. 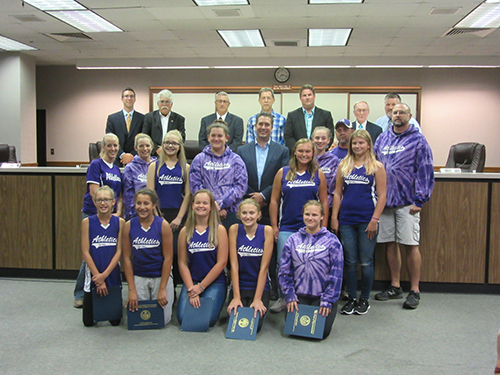 I was thrilled to present certificates to the players and coaches of the South Central Girls Softball Team in honor of their second place victory in the USSSA World Series East Tournament. The Hershey Powerlifting team placed second overall at the PA state championships, breaking 12 school records in the process! Six members of the team also won their individual events. Hershey High School powerlifters in the front row (from left) include Joe Russell, Devon Davis, Ian West and Kyllian Harper. 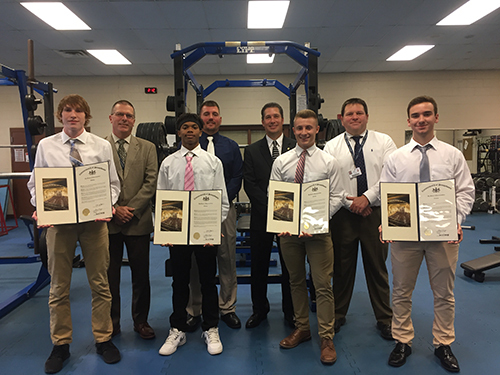 The second row (from left) includes Derry Township School District Superintendent Joe McFarland, HHS Powerlifting Coach Troy Smith, me and HHS Principal Jeff Smith. The team was first formed in 2004 to provide athletes with the opportunity to increase muscle mass, make strength gains and increase their speed. Pennsylvania Secretary of Community and Economic Development Dennis Davin and I visited the Maculogix facility in Lower Swatara Township last week and got a brief introduction to their age-related macular degeneration (AMD) assessment tool called an AdaptDx Dark Adaptometer. Dr. Gary Kirman’s office in Hummelstown was among the very first local offices to receive this cutting-edge machine, which was developed with the help of medical research funding from the Commonwealth at the Hershey Center for Applied Research (HCAR). 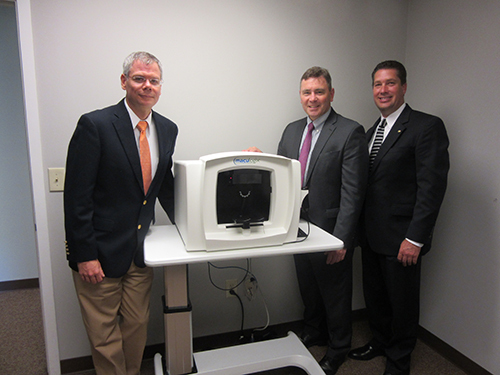 I am pictured above with Maculogix’s Chief Technology Officer Dr. Greg Jackson (left) and Secretary Davin (center).